Hello, (13-12-00) My name is Clay Lane. 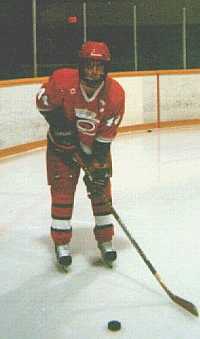 I am 17 years old and I am captain of the Chapleau Hurricanes. This year, the Hurricanes are in our Own Independant league. Therefore we can pick and choose where and when we want to play. Our team consists of 16-17 year old players. SO far, we have played 4 games. Our first game was against Wawa. We had lost that game 6-4 due to line problems. We only had 2 centermen. Myself and Andrew Orton. Therefore we had to double shift to make up for the 3rd line. Hehe, it was very exhausting! Our goaltender let in some soft goals, in the end losing 6-4. Then, our team was invited to Sault Ste. Marie, home of Ron Francis:) The tournament was called Steel City Tourny. It was a great tournemant with teams from all over Ontario and 1 team from USA. Our first game was against the team from the USA. I, was not able to play because I had a suspension to fill. We won't go there.....lol:) The first puck drop, our gritty Andrew Orton had jumped right on the puck, brought it into their end, and scored! Must have been about 10 second and we opened up the scoring! With another goal at the end of the first, we were in the lead with 2-0. We let go, and ended up tieing the team 4-4. The second game, was my return. It was great, we were the best hitting team on the ice. We had won that game 4-0. The 3rd game, was a close game. Our team was not playing to it's full potential, and ended up losing 2-0. But, our team is just getting started. We are attending a tournament in Timmins, Ontario in January. (05-07-00 xRadis) First article on non-european hockey comes from Canada. Echo analyses the question of NHL expansion and relevant problems. But the article does not concern Europe only at first view. The upcoming 2000 - 01 NHL season will include two more expansion teams, Columbus and Minnesota. Is this to many teams? No! Although some in the media would like us to think so. They believe there is not enough quality players to fill 30 NHL team rosters, therefore making the overall product less competitive. The problem with expansion is not expansion itself, it is where the expansion is occurring. The NHL talks about how important it is for the future of hockey to grow in all areas. This is very important, but the problem is they are only trying to grow the game in the United States. If you really were serious about growing the game, you would try to grow the game world wide. The league has added nine new franchises in ten years, and all but one were in the United States. This massive growth in such a short period of time, has caused many teams to struggle financially and attendance has dropped in many cities. Why has expansion had this negative affect on the league? With more teams added means new resources must be found, and in a business where the resources are limited, means competition for those resources are at a much higher demand. When a product is in high demand, the product becomes more expensive, as we have seen with players salaries rising by four hundred percent in the last ten years. This has caused ticket prices to rise to a much higher level, and now fewer fans can afford to attend games. With fewer fans being able to attend games means, teams are not bringing in as much money, this is what has caused attendance problems and teams to struggle financially. The NHL will have to solve this problem, and they believe if they stop expanding everything should settle down and work out in the end. I don't believe this solution will work. There is to many cities that are in the same financial markets and have to compete with each other for advertising and sponsors. These franchises that are struggling should be moved, but not to other cities in North America, that solution is just not working. So who are these teams and where should they be moved? This list of teams should be moved, because they will never survive in the end. The fans who support these teams should not feel ashamed, or angry, because there simply is just not enough resources and fan support in North America for the game of Hockey. -Carolina Hurricanes, this is not a hockey market, and how can you support a franchise when your attendance is only 6000 almost every game. -New York Islanders, they have the same attendance problem as Carolina, and one team is enough in the city of New York. -Atlanta Thrashers, this team in a few years will have problems, because hockey is just not a sport that will thrive in Georgia. -New Jersey Devils, like I said New York should only have one team, and on most nights it is Ranger fans filling the building. -Pittsburgh Penguins, the fans in this city love their team, but it is a small market team, who are on the verge of staying or going right now. -Tampa Bay Lightning, it is first few years it done well, but has been on a steady decline ever since. -Anaheim Mighty Ducks, if it was not for Disney does anyone really think this franchise would be in Anaheim. Lately Disney has been talking about getting out of hockey, this is not good news for the Mighty Ducks. -Edmonton Oilers, they pack the building every night, and probably have the best fans in the NHL, but it is just to small of a market. -Minnesota Wild, they already lost a franchise a couple of years ago, I am still wondering how they received another one. -Buffalo Sabers, they are to small of a market relying to heavily on hockey fans, advertising and sponsorship from the Toronto area. I guess the big question is where should all these teams be moved to? In my personal view they should be moved to cities in Europe. This would be the best solution to all the problems facing the NHL. Twenty percent of the players playing are from Europe, and there is lots of large market cities in Europe who can financially support franchises. If the NHL is serious about growing the game, then I think it is time they expanded to the proper spot. This may happen some day, but I would not look for it to happen any time soon. The NHL would give the excuse, that Europe is to far away, and it would cost to much for teams to fly back and forth. Well it would only cost to much for the teams that are struggling now, and if they were moved to Europe they wouldn't be struggling anymore.